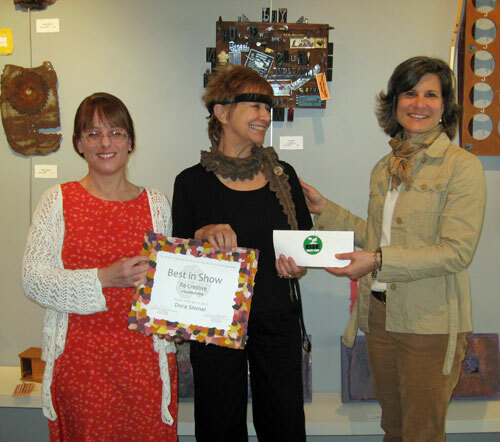 Artist Dora Siemel received Best in Show honors for her piece, Buy More Stuff!, at a reception at the Gallery on High, Saturday, April 14. 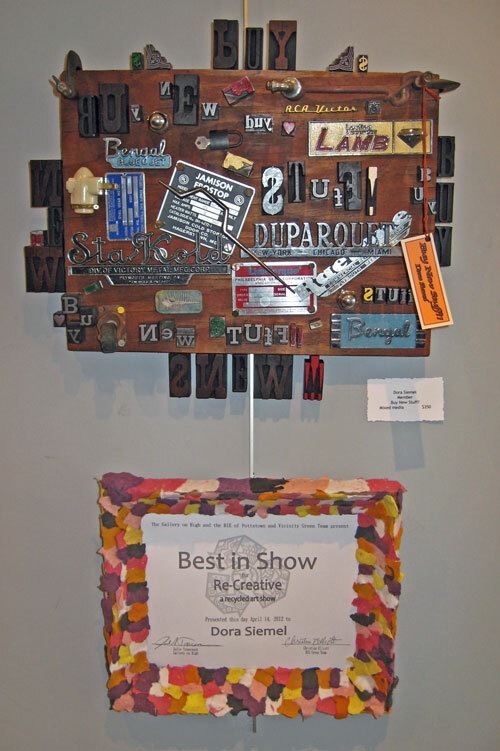 Dora and 19 other local artists participated in Re-Creative, a recycled art show. Entries in this show had to be created from recycled, upcycled or salvaged materials. Buy New Stuff!. . . stood out to the judges as a lively piece of art, steeped in the nostalgia of quality American manufacturing, while poking fun at our current culture which thrives on poorly made goods and constant consumerism. While strong social messages are observed within this piece, it also stands alone as an artistic historic tribute. The artful arrangement of materials from consumer products is delightful and the reclaimed nature of the materials strictly followed the theme of the show. The reverse form inherent in the newspaper type elements used added an intriguing, reflective symbolism to this piece. The piece takes us on a journey into our past, as it prods us to seriously consider our future. Re-Creative runs through April 21. Guests can view the exhibit during regular gallery hours: Tuesday through Friday from 10am to 4:30pm and Saturday 10am to 3pm. The Gallery is closed Sunday and Monday.